A neo-classic rock style that was developed out of the Austin, Texas music scene and recalls the energy of the 60's and 70's with a modern and unique vibe. So many artists have been hauled out of obscurity to be tagged the greatest secret youâ€™ve never been told. Rick Blincoe is one of the few who actually deserve that epithet. Rick grew up in Austin, Texas during a time when â€œbeing in a bandâ€ was as much a competitive sport as artistic endeavor. His influences are rooted in the British invasion, beginning with those four lads from Liverpool and then cemented by the Clapton-Beck-Page hammer. Additional influences came from the energy of the Psychedelic, Armadillo World Headquarters, love beads, love ins, free love, flower children, black light posters and incense, expansion of consciousness, spiritualism soaked in the idealism of the late 1960â€™s and 1970â€™s. Rickâ€™s rock-and-roll resume is long and diverse as his musical journey has been non-stop since those early days. He continues to grow, learn, and seek his own voice, because what really matters today is today. 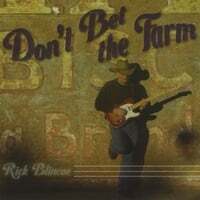 With the release of â€œDonâ€™t Bet The Farmâ€, Rick paints his picture of the journey through life by recalling the innocence of adolescent awaking with â€œMs. Beehayvenâ€ and the frustrations of adult survival with â€œHarleys and Horses, Guns and Goldâ€. The songs on this CD represent Rickâ€™s vision of the human condition while remembering the past and driving toward the future. Love the variety. The album is entertaining all the way through. Very modern and hip.